Running now through August 26th, the IMPACT 2012 Festival consists of documentaries, satirical political comedy, music, theater and new art created by emerging and established artists along with provocative conversations focusing on subjects crucial to the decision making process as we move closer to this year’s election. Presented by Culture Project, home of such challenging and jaw-dropping political works as The Exonerated and Guantanamo: Honor Bound to Defend Freedom, a key part of IMPACT 2012 is its flexibility and ability to respond to changes in the political debate immediately, adding new events every day to challenge those questions. Culture Project is dedicated to addressing critical human rights issues by creating and supporting artistic work that amplifies marginalized voices. By fostering innovative collaboration between human rights organizations and artists, we aim to inspire and impact public dialogue and policy, encouraging democratic participation in the most urgent matters of our time. Events still to come include a performance of Goliath, a poetic theatrical retelling of one soldier’s war story; screening of Miss Representation, a look into the misguided view of women in the media; a Conversation on Voter Suppression with Isiah Castialla of Alliance for Justice; an evening of short films related to constitutional rights and a Conversation on Foreign Policy lead by Jennifer Robinson, a former legal representative to Wikileaks’ Julian Assage. ***AUTHORS NOTE**** August 7th, IMPACT 2012 will feature “Play-In-A-Day”: The War on Women. After being given 16 hours to complete a short play on the war on women, the playwrights and actors will perform under the spotlight. This is a must see event! 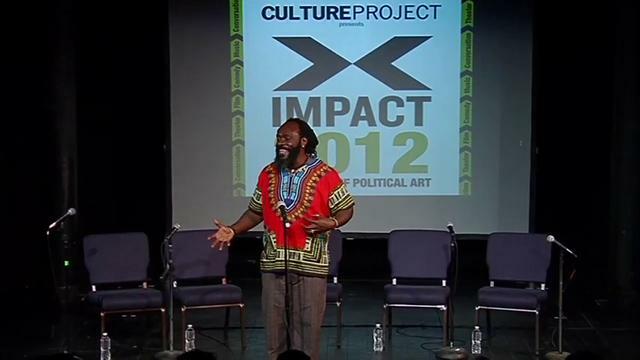 Email impactfest@cultureproject.org for more information.